Working exclusively with Edwards Greenhouse, Yoga Pop aims to bring you the magic of yoga daily! Join instructor Jason Allen Carr in celebrating the outdoors and becoming more in tune with your Mind, Body, and Soul. A unique yoga experience at Edwards Greenhouse invites particinpants to share energy with the surrounding plants, open up their hearts to the universe, and ground themselves to the Earth! 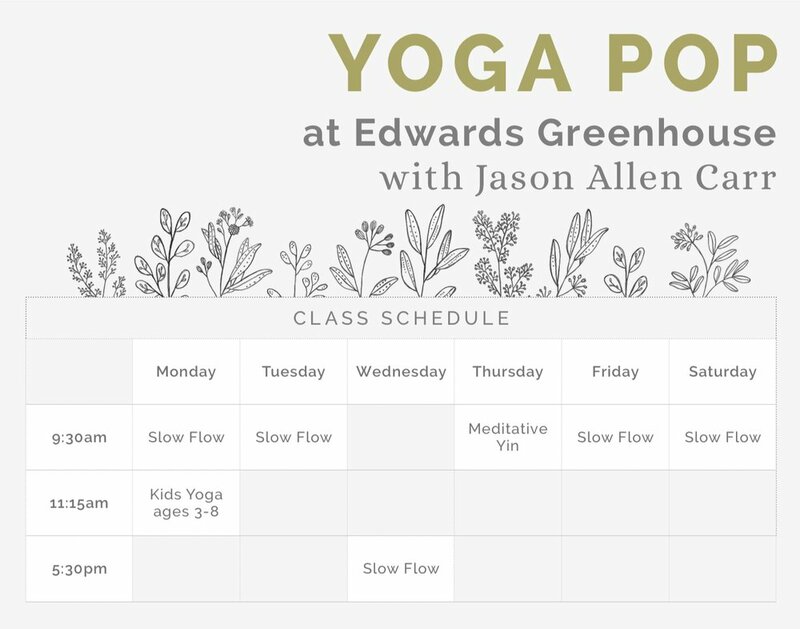 If you have any questions or concerns please contact Jason Allen Carr at Yoga Pop, not Edwards Greenhouse. Kids yoga classes vary based on the age group that comes. Pop culture references are used to describe visualization/pretending. We’ll focus on learning the 7 major chakras in each class. I put an emphasis on being aware of the aura (energy field around the body) as we practice trying to see and feel it. Mindfulness and kindness are encouraged and discussed. No one kids’ class is the same. Come dressed accordingly (think layers in winter/fall as classes are inside the greenhouse and lighter fabrics in spring/summer as classes are outside in The Legacy Gardens). Bring your outdoor mats and any props you like to use during your practice, as they are not provided. The temperature of the greenhouse is based on the weather that day. Lots of sun brings warmth to the greenhouse, low Sun may make it slightly cooler.